You are currently browsing articles tagged Proclaimer. I was able to make contact with many of our friends yesterday and found myself refreshed and more excited than ever to redouble my efforts to return to Mexico to join them. Take my conversation with Josué Novelo, our partner in Yaxcabá. He began the outreach in Santa María, a city characterized by its outward signs of abandonment and decay. 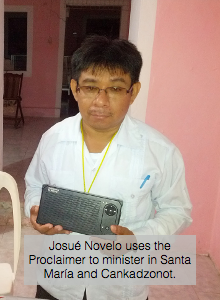 He has been meeting regularly with the people of the village, utilizing the Proclaimer device to provide them with an experience with the Word of God in their own language. Where hopelessness once reigned, the people of this village are interacting weekly with the Bible. Since the program began, they’ve finished the Gospels and have moved on to Romans, glad to be able to understand what they’re hearing. What’s more, he’s also opened a new work in Cankadzonot, further extending the impact of the Faith Comes by Hearing program. We’re excited to share this news with you, news of fruit that has remained and that’s reproducing itself on the Yucatan. 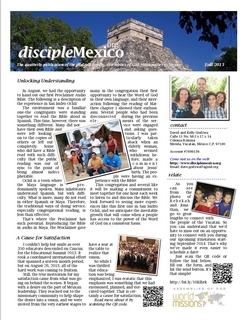 We hope that you in turn are also encouraged to involve yourself in what God is doing on the Yucatan peninsula. Get Our Fall Newsletter Now! 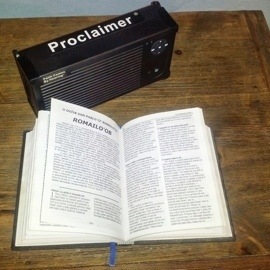 We had the opportunity to deliver our first Proclaimer to San Isidro Ochil. 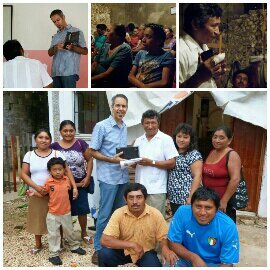 What a blessing to hear the group interact with the Word in Maya! Hit the link here or click on the picture to experience the event with us. While you’re there, don’t miss the rest of our latest quarterly update from the field! The environment was a familiar one–the congregants were standing together to read the Bible aloud in Spanish. This time, however, there was something different. Many did not have their own Bible and were left looking on to the copies of others or left out completely. Some who did have a Bible read with such difficulty that the public reading was out of sync to the point of being almost indecipherable. You see, Ochil is a town where the Maya language is spoken predominantly. Many inhabitants understand Spanish, but with difficulty. What is more, many do not read in either Spanish or Maya. Therefore, the traditional ways of doing service, especially congregational reading, is less than effective. That’s where the Proclaimer has such potential. Reproducing the Bible in audio in Maya, the Proclaimer gave many in the congregation their first opportunity to hear the Word of God in their own language, and their interaction following the reading of Matthew chapter 1 showed their enthusiasm. Several people who had been disconnected during the previous elements of the service were engaged and asking questions. I was particularly taken aback when an elderly woman, who seemed withdrawn before, made a comment about Jesus’ birth. The people were having an experience with the Bible! This congregation and several like it will be making a commitment to meet together for one hour each week to listen to and discuss the Bible. We look forward to seeing more experiences like this first one in San Isidro Ochil, and we anticipate the inevitable growth that will come when a people has access to the power of the Word of God on a consistent basis. Pray for us as we continue to expand this program to other villages. Pray for each village that they would make the commitment to listen and to study the Word of God together each week for an hour. Pray that God’s promise that his Word would not return void would be fulfilled in each separate context where it is introduced.